A mural wall will instantly add a focal point to any room and is a great option if you are after something a bit more exciting than standard wallpaper. However, like wallpaper, a mural can quickly be put up in any room or even created using removable decals – the perfect option if you are renting your home and want an easy update. Or, if you fancy yourself a dab hand at art, why not get really creative and paint your own design freehand, or using a masking tape/stencil guide instead? This is the perfect way to add a fun and personal touch when designing a kid's room. Got a weekend to spare? Whether you choose stickers, wallpaper, or paint, we have plenty of ideas to get you started and tips on how to add your own mural. Before you start, check that your wall is smooth and clean. If you are using paste-up or stick-on murals, the last thing you want is lumps and bumps poking through, so fill and sand any dents. Clean the wall and remove flaking paint, then finish with a coat of primer to seal the wall (this is important for fresh plaster, too). For painted murals, you might want to apply the base colour the night before so it is dry and ready for you to get cracking first thing. A light base colour is best under stick-on murals as some are made from a slightly transparent material. If you are sticking a mural to a freshly painted wall, allow two weeks for the paint to thoroughly dry. If you are a bit of a commitment-phobe when it comes to your décor, you can now buy peel and stick panels that are easily removed should you want to update your space in the future. Just choose a design online, enter your wall dimensions and a bespoke wall mural will be sent to your door. Applying them is a two person job. When the panels arrive, roll them out to unfurl the edges. Use a spirit level and tape measure to draw a guideline a panel's width from the wall edge. You can then hang the panels from left to right, removing a small section of the backing paper to position the panel at the top of the wall, before smoothing into place. Murals aren't just about creating a scene or picture on your wall. A larger than life print will make a striking impression without being overwhelming. And, these designs tend to have a more limited colour palette than some murals, making accessory choices more easily informed. Nature-inspired patterns in front of a bright colour are fun but grown up. Or look out for asymmetric patterns built from different shapes and colours. Got a picture you adore? Forget printing it and framing it – have it blown up to fit your whole wall. Be it a family holiday destination, your favourite album art or even your own face (we won't judge), make your room as personal as can be with a unique design. An allover mural can dictate your furniture placement – nobody wants to hide the most important elements of the picture behind a sofa or bed. So sticking decals to a painted background means you can create a mural with greater flexibility in the design. What's more, many decals can be quickly removed should you wish to change the scheme. This makes them perfect for a kid's room – a simple base colour will have you set for years if you add and remove stickers as their tastes change. If you are on a budget, painting your own mural is the way to go. From simple tree outlines to fluffy clouds, there are plenty of designs that can be created freehand or with the help of a stencil. You don't need to be particularly artistic to create a fun mountain range as seen on many a Pinterest board. Go for a basic design of one colour, or try adding snowy caps in a contrasting shade. You really can add as much or as little detail as you desire. We are suckers for terrazzo and marble, but how can we afford a full plinth of the real stuff fixed to our walls (plus the bathroom wall would be straining under the weight)? So why not fake a feature with your favourite material printed full width across the room? Or, fancy an industrial-style exposed brick, but don't want the effort or plaster dust of the real thing? Mock it up with a brick-print paper. Some murals are available in wipe-clean, waterproof materials too so you can get that glam Carrara marble finish you dreamed of in your kitchen or bathroom. This idea is probably more apt for a child's room (unless you like your rooms to feel like a themed Disney hotel) and can be a fun way to incorporate necessities like storage and lighting into the design. Why not add a sun, star or moon wall light to a mural showing the sky? Or let the branches of a tree disguise hooks or shelving. We know this isn't exactly a mural, but a wall painted with chalkboard paint creates a canvas for all of your latest creations. Once solely known as blackboard paint, it doesn't have to be black anymore with some companies offering a wipe-clean, chalk-ready surface in every colour. So, give a wall a coat in your favourite shade, grab a box of chalks and get creative. Read our top tips on painting a chalkboard wall. 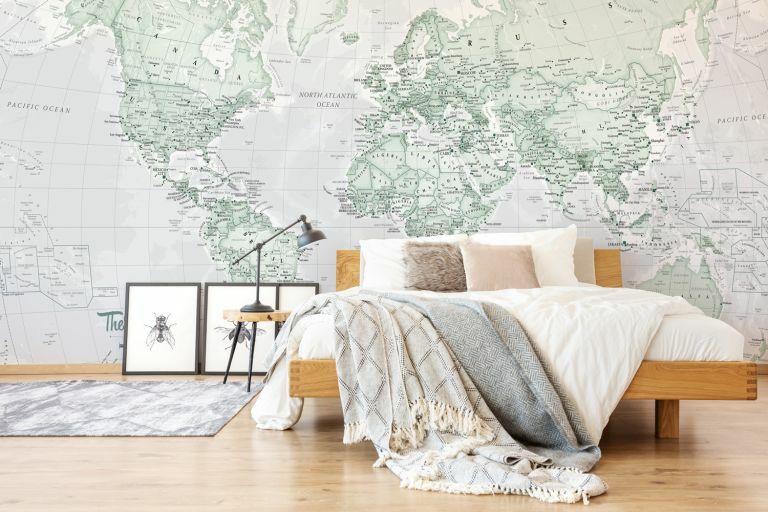 No biggy... A great idea for those with wanderlust, paste a map of the world to your wall as a reminder of all the places you have visited and those you are yet to see. You could even get a black and white version that you colour in to tag the places you have visited. For kids' rooms you can get fun world maps showing where different animals are from. Or more of a home bird? Why not get a map of your hometown printed on the wall. Looking for more ways to transform a room in a weekend? Why not paint your stairs?